or rather, good morning as it's half seven in the morning here. And yes, I haven't slept yet. You see darling and me had our 1 year wedding anniversary yesterday. And we spent the whole night partying ofc. So now I am still so hyper and I cannot sleep. 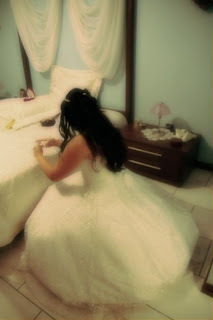 Instead I will share with you my bridal nails and make up. Yayyyyyy!!! As every bride I was very excited on deciding how my hair, make up and nails would be. 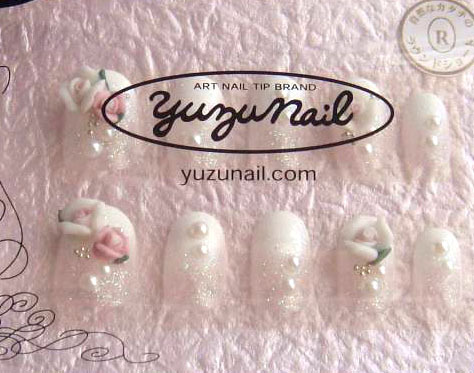 I bought a few fake nail sets from Japan and kept trying them on and on, trying to figure out which one to use. 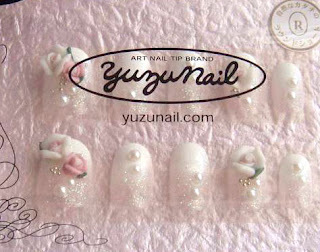 The winner was this lovely hand painted nail set from Yuzu Nail that I bought in MaruiOne. I applied them at the very last minute using nail tape and I am so happy I chose them. This photo was from when I first bought them as now they are flying around somewhere in the house and I need to locate them (I swear half of my things are MIA since we moved). As for my make up I did not want something subtle but I wanted to go all the way. Being a dark chick who likes gothic looks since I was a kid I decided that it should show at least in my make up (as Greece is too traditional for brides to be able to wear let's say dark or medieval wedding gowns without the parents having multiple heart attacks). 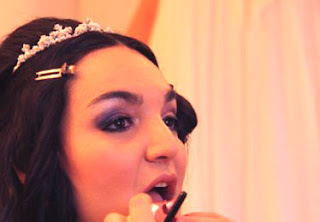 So we used purple shades, lots of purple glitter and Shu Uemura eyelashes with dark Swarovski crystals. I also got this lovely tiara from acpetrille's etsy shop . It was such a crazy day and I don't remember much but looking back at the photos I am pleased with how everything turned out. Still I am glad it's over XD (you can tell I am not one of the girls who dream of getting married since they were kids). And I am gonna close this post with a bonus shot of me trying to put on my nails before leaving the house to get married. It was insane I tell you, insane! Congratulations! Like your pretty make-up and nail set very much. Congratulations! Your nails and makeup look gorgeous. The purple makeup is so so beautiful on you and those nails are so darn pretty! @'Chelle awwww thank you so much dear. I cannot believe a year has passed already. @AnnKiins' thank you ^_^ they were quite comfortable too. @Sachie thank you. Ufufu there is such a great selection in Japan, I just wish some of those goods were available overseas too.